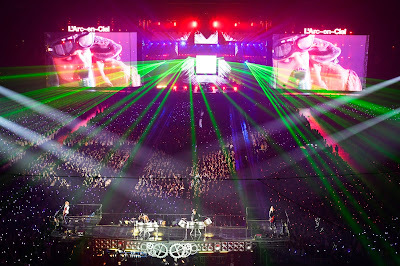 LIVE REPORT - L'Arc~en~Ciel 25th L'Anniversary Live @ Tokyo Dome Day 1 | VKH Press – J-Rock & Visual Kei Coverage Worldwide! 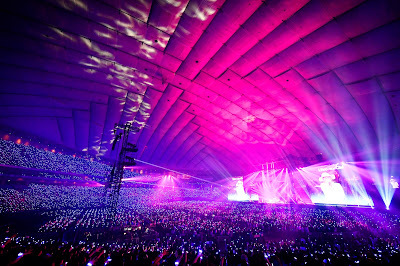 On April 8th, 2017, legions of excited fans swarmed Tokyo Dome for Day 1 of L’Arc~en~Ciel’s highly anticipated 25th L’Anniversary Live. 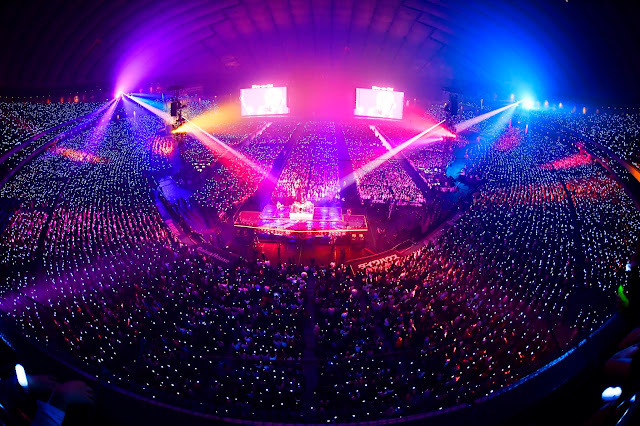 The Dome was filled to maximum capacity, with tickets selling out in seconds and simultaneous broadcasts being streamed in cinemas all over Japan and in over 10 countries worldwide. This was a day of epic proportions. A hush of anticipation settled over the excited crowd as the lights in the dome dimmed and three massive HD screens behind the stage flickered to life. Without knowing what to expect, the audience gasped in surprise as they were pulled into the far future. The year was 9125, a mysterious character was currently searching for information on the super band “L’Arc~en~Ciel”. Unfortunately, it seemed that the data from the 2017 L’Anniversary Live was missing. The character’s name was Ellie Cranc. Their mission was to go back in time and collect the fragments of L’Arc~en~Ciel’s history from 2017. 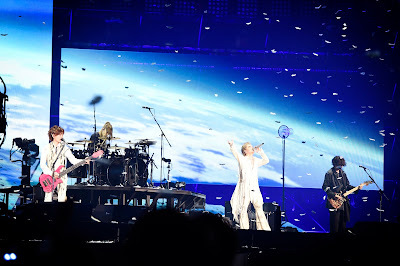 The crowd began screaming in excitement as digital fragments on the screen swirled together and took the shape drummer yukihiro, then guitarist ken, bassist tetsuya and finally vocalist hyde followed by the words, “Mission Complete”. Images of turning cogs appeared on the borders of the screens and the stage was bathed in a golden light as the figures of the four members finally came into view. hyde’s voice echoed across the venue for the beginning of “虹 (Niji)”. He wore an outfit that had layers of white and muted brown fabrics that caught the wind easily, while tetsuya was decked out in shining red while ken and yukihiro matched in rich black. The fans immediately began swaying along to the music. The lights switched between vivid rainbow hues that projected out towards the crowd, to deep red and yellow during ken’s solo. The unmistakable cheerful piano intro of “Caress of Venus” filled the venue and the crowd immediately sprang to life, clapping along and jumping. The energy was bright and infectious and the members all looked like they were having lots of fun. “the Fourth Avenue Café” was immediately after and the venue got even more vibrant. hyde screamed, “Tokyo! Jump! Jump!”, keeping the audience moving and ran to the far end of the stage to get closer to the crowd. At the end of it, the band paused and hyde welcomed their audience amidst non-stop screams and cheers of appreciation. ken chimed in at that point, with random anecdotes about what had happened in the past 25 years (which included red pandas, axolotl and oompa loompas). hyde cut it short with an easy, “Ok that’s enough...” causing the entire room to laugh even more. After that, hyde told the audience, “Let’s become one!” and slammed his hands down on the floor, immediately starting a wave of hands that went all the way to the back of the dome. Still not satisfied, he started another one. This time, the wave returned to the stage and as it returned to hyde, a strong wind blew over him, sending the tendrils of his clothes flying in the air and making the crowd cheer in delight. “flower” was next and the gentle melody was accompanied by soft, blue spotlights. For “Lies and Truth”, various clips from L’Arc~en~Ciel’s promotion videos played on the screens behind the band. The clock cogs were imposed over the clips, giving a sense of all the time that had passed. The audience were singing along as well, showing their appreciation for these well-loved songs. At the end of the song, all the video screens cut off one by one, sending the dome into darkness. Smoke began blowing across the stage and it took a moment to realize that it was just an image on the screen, realistic as it was. From the smoke, bright flames lit up the area, surrounding the band. Around them was dim purple lights and thunderous clouds overhead. As they performed “fate”, they looked like a warm refuge in the middle of a stormy night. The flames remained but this time, the area around them had turned into gentle ocean waves with a glowing full moon overhead. 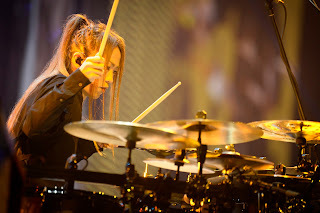 yukihiro’s drum intro echoed throughout the dome and the instruments together with hyde’s voice sounded even richer and more emotional in the dark atmosphere. The crowd stayed fixated on the stage as the gentle waves turned into a raging storm and finally flames engulfed the band, leaving nothing but embers. hyde broke the silence that followed, screaming, “1, 2, 3, 4!” and then the dome burst back to life for “Shout at the Devil”. Real balls of fire and flames shot into the air and the members all moved with fiery energy to match. “REVELATION” was a pure treat for the fans. In the dark, the wristbands that everyone wore began pulsing in deep red in time to the beat. This time band was on an elevated platform above the stage getting the room fired up. hyde and ken were pounding away on the drums while tetsuya and yukihiro added intense guitar riffs. 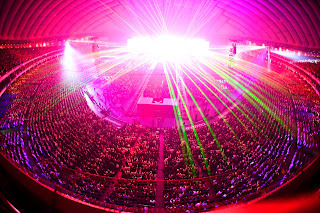 The excitement reached a peak when the platform began to move, traveling over the crowd and stopping behind the arena seats and just before the first floor stands. From there, they performed “Voice” from their very first album. The dome was lit in nothing but soft blue lights, keeping the focus on the words and music alone. After that, the wristbands were put to use again, forming the letters “X X X” for the next song. hyde perched a military-style cap on his head and showed off his sultry side, licking his fingers and twirling his hips. The stage itself was lit in deep pink lights, adding to the atmosphere. They returned to the main stage after this while throwing baskets of capsule toys at the fans who were having fun reaching out to grab them. The crowd got to see random clips from the all the years past and it was astonishing just seeing how young they were and the crowd couldn’t stop laughing at all the nostalgic behind-the-scenes antic and performances. Even so, despite the physical changes, the band still felt as impressive as ever. The band returned to the stage, this time in elegant suits, showing off their maturity and refinement. “花葬 (Kasou)” was accompanied by striking android dancers who twirled effortlessly around poles behind the band. The members refrained from moving around much, letting their performance convey all their emotions. 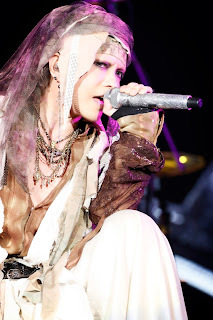 “浸食 -lose control- (Shinshoku -lose control-)” had a much darker atmosphere with hyde giving his voice a raw edge to match with the heavy guitar riffs. Digital images flashed around the screen as more android dancers twisted their bodies in time to the music. The stage lit up with golden lights and honeycomb designs for “HONEY” and then returned to darkness at the end. 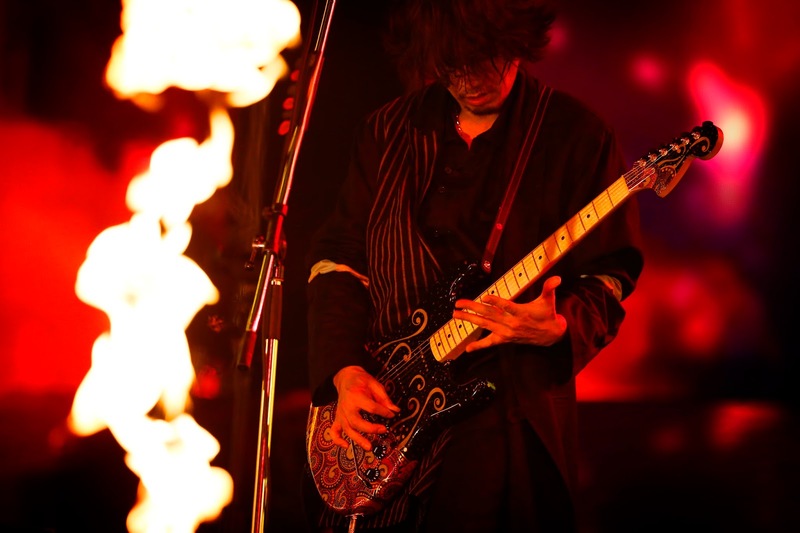 The lights were focused on ken alone as he played gentle guitar scales that built up in intensity until it crescendoed into the intro of “MY HEART DRAWS A DREAM”. hyde returned on stage in all-white and L’Arc~en~Ciel and their fans came together as one, singing with all their hearts. From there on it was time for even more fun. “NEO UNIVERSE” had images of a futuristic highway with colorful floating cars. One of the cars drove right off the screen and into the audience, floating high above the delighted audience. 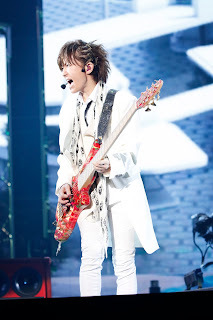 tetsuya led the crowd for “STAY AWAY”, getting them energized and strumming on his bass. Everyone was dancing along and “Driver’s High” only kept them on their feet. It was impossible not to feel the fun energy vibrating across the venue. The band wanted the crowd to go even crazier and hyde screamed, “Tokyo! Give me some of your strength! You were waiting right? You wanted to see us right? So show us! !” The screams were at full volume now and the band used that energy to deliver an explosive performance of “READY STEADY GO”. Streamers burst out into the crowd, making it even more fun. The members all talked comfortably for a bit longer and then hyde had the crowd do another wave. After that, they performed “Blurry Eyes” which was amazing to see because the screens were split in half. One side showed videos of the members from the past, while the other side showed the present. Giant balloons were bounced around in the crowd during “Link” and on the screen, images submitted by fans were scrolling past. It was the type of performance that would not have been possible without the cooperation of the band and their fans. They paused during the performance and hyde told the band, “Let’s do a member intro for the first time in 9 years.” Each member was called and the audience screamed at the top of their lungs, showing all their love and support. “あなた (Anata)” brought the spectacular live to a close. A massive disco ball spun overhead and scattered beams of light that made it look like everyone was gathered under a starry sky. You could feel all the emotions that the band poured into the music. 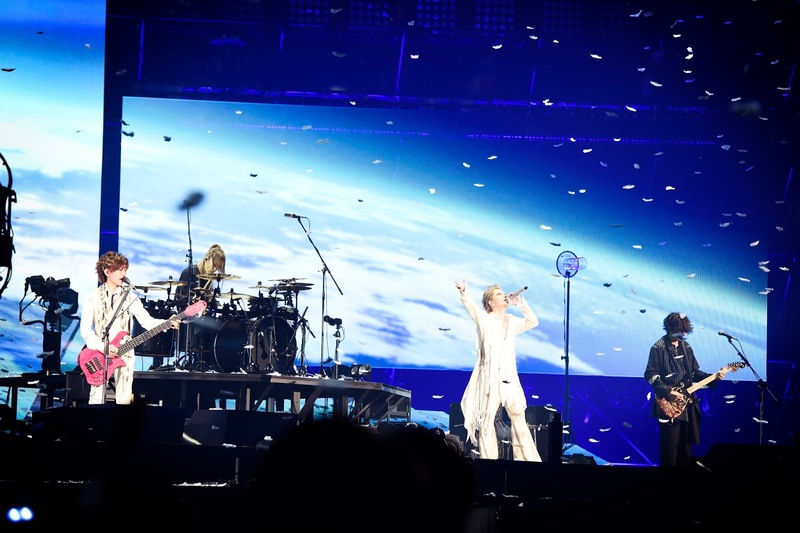 The night-time atmosphere slowly melted away as the image of a rising sun appeared on screen marking a brand new year of possibilities for L’Arc~en~Ciel together with their devoted fans. Thank you to L'Arc~en~Ciel, their label and staff for this opportunity!